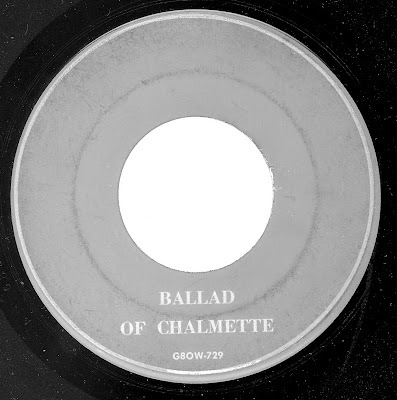 This recording, an extract from one of Bill Cason's radio shows, was originally broadcast over Radio Station WWL sometime in 1956. It obviously caught the imagination of someone who thought it would make a nice memento for the staff and management at the aluminium plant in question. 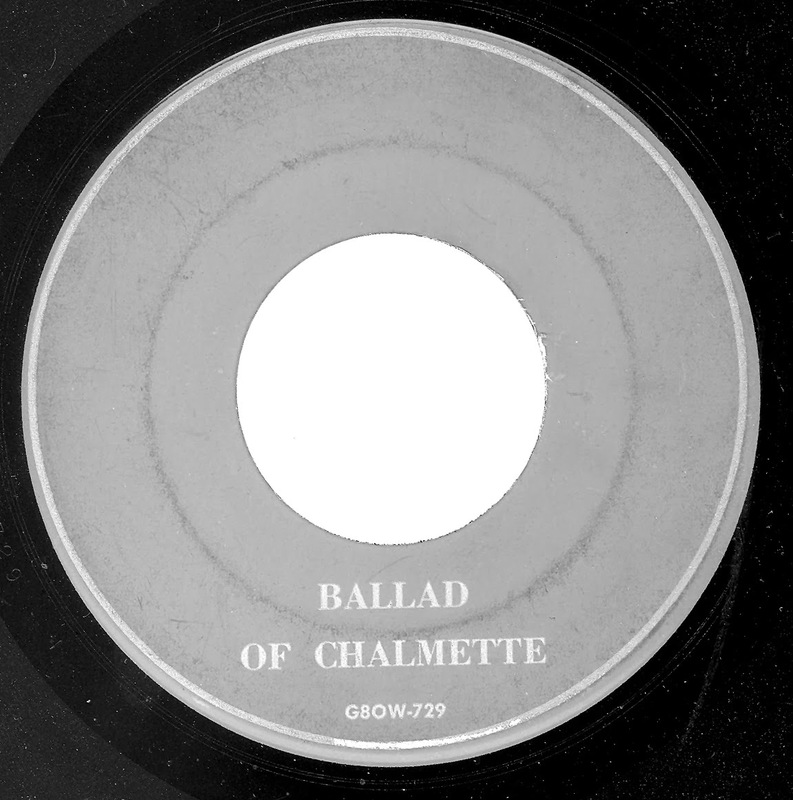 The song was issued on a single sided RCA custom pressed record. The label was actually silver print on a green background, but that just wouldn't scan, so what is displayed below is the only way that I could get a readable scan. 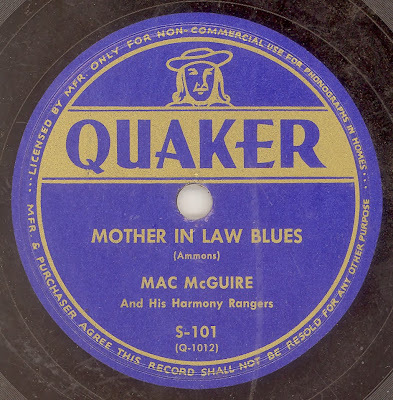 MAC McGUIRE "Mother In Law Blues"
The Library Of Congress (Copyright Office) catalog of copyright entries: Musical compositions, (Volume 41) notes that the composer of "Mother In Law Blues" was one James D Ammons, with words by James Gardener (although Gardner was not credited on the label). 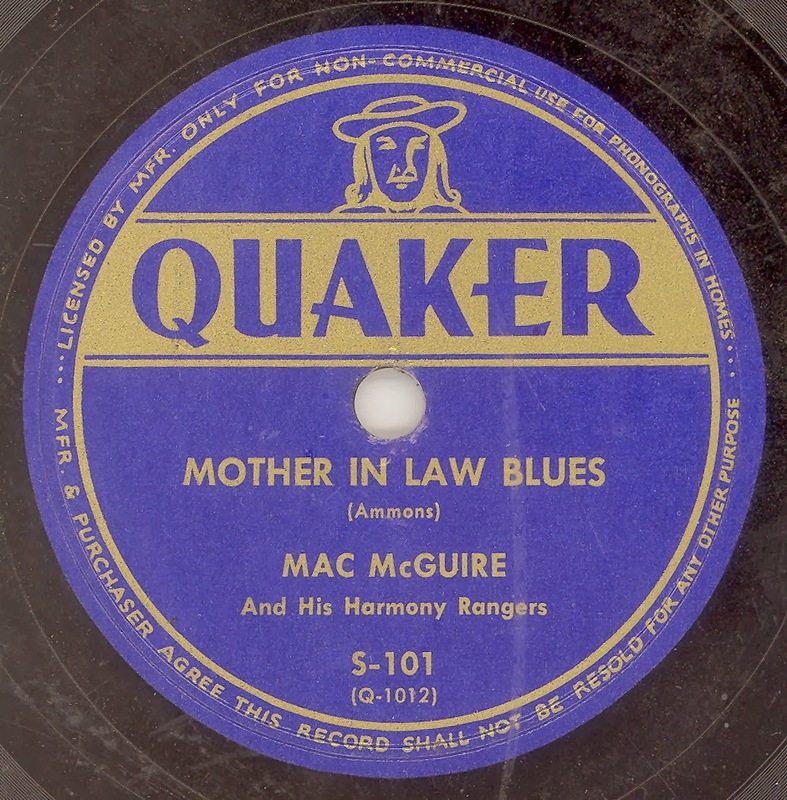 The song was registered (EU40388) by The Quaker Music Company of Philadelphia on 15th August 1946. 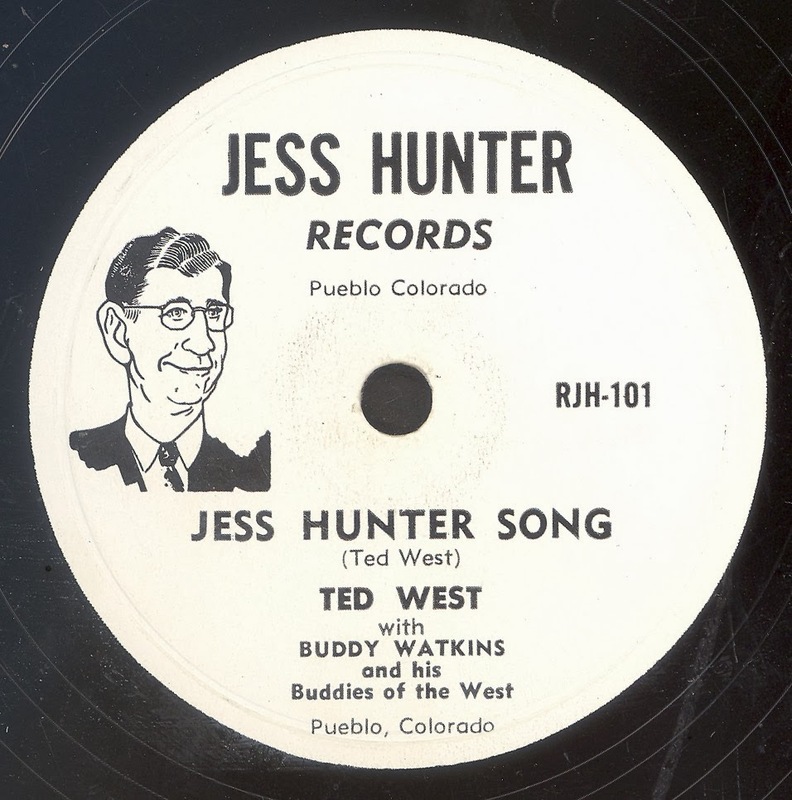 Jess Hunter ran a car dealership in Pueblo, Colorado. His brief venture into the recording field was essentially a self promotional affair. 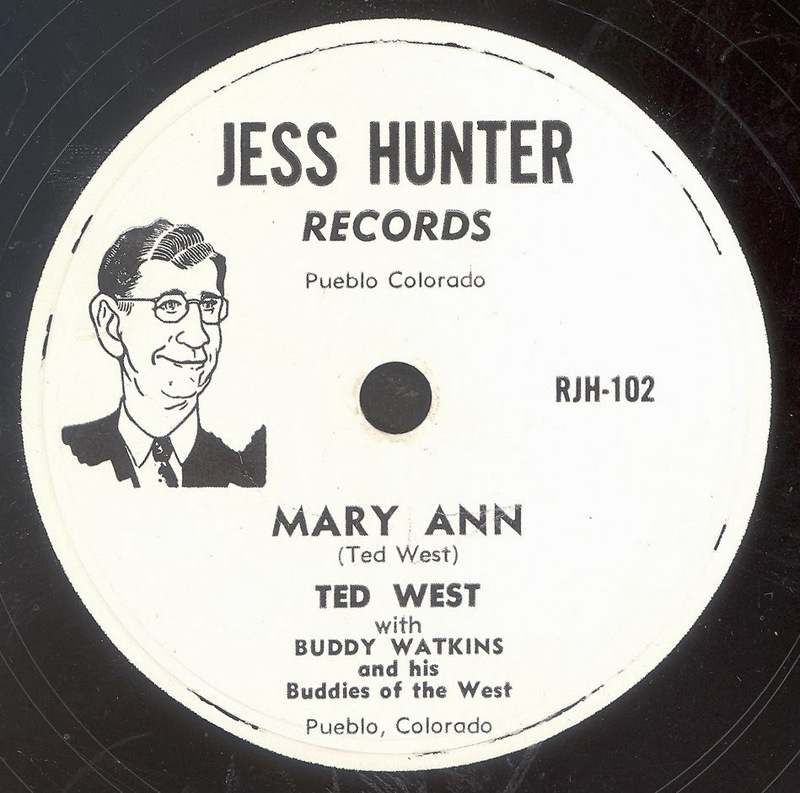 The sole offering was by Ted West, presumably the artist who had previously recorded for REPUBLIC, and MGM Records. The backing band, Buddy Watkins and his Buddies Of The West, also had a release on the local CANYON label. This is an update on the original posting in April 2010. CHUCK MURPHY - "DALLAS BOOGIE"
Chuck Murphy is a difficult artist to pigeon-hole, that in itself is not such a bad thing, but sometimes you need to be able to place an artist in a particular musical category in order to manage research. Murphy had a go at a number of different musical styles, Hillbilly, Dixieland Jazz, and (for want of a better term) Pop. 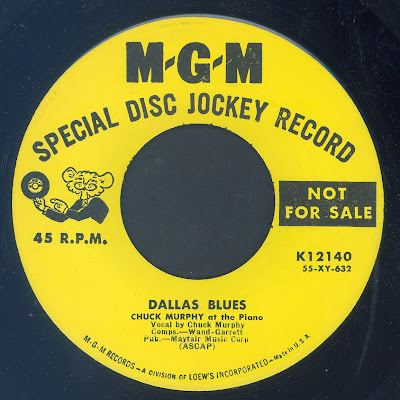 Here he turns in a passable blues offering, there is nothing else in his recorded repertorie that comes remotely close to this ditty by Murphy. I thought we'd stay with the FLAIR label for a little longer and take a look at The Rhythm Harmoneers who, like Jimmy Walton, had just one solitary offering on the label. 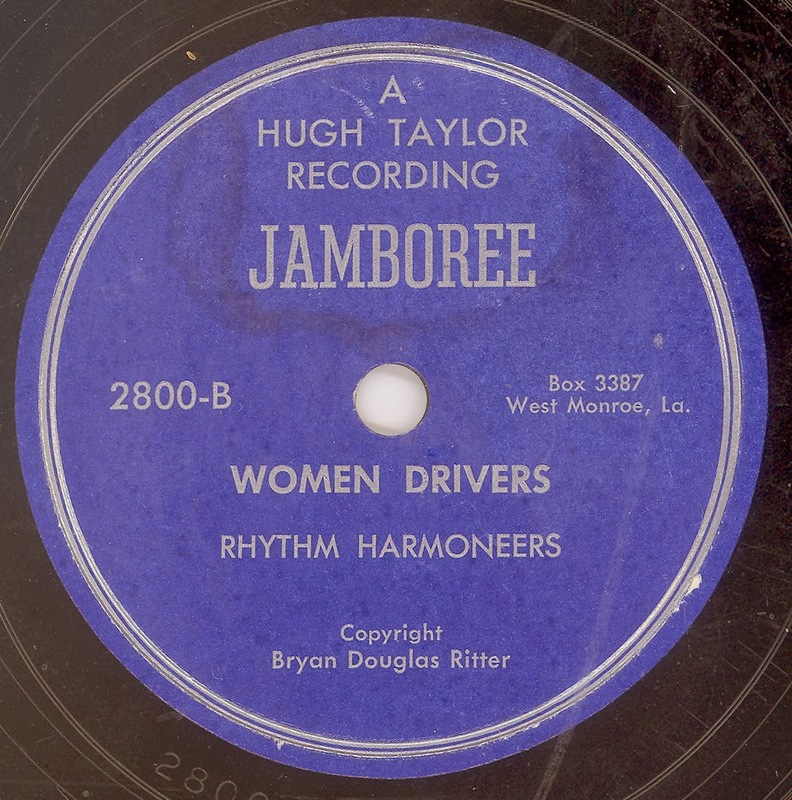 It would seem that the Harmoneers had previously recorded for the West Monroe, Louisiana JAMBOREE label before cutting at least two sides for FLAIR. 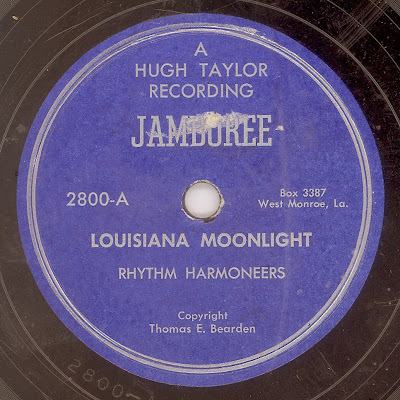 My initial thoughts were that the Harmoneers were regulars on The Louisiana Hayride, however, having picked my way through Robert Gentry's "The Louisiana Hayride" (Volume 1 - 1948 thru 1955), I could only find one reference to the Harmoneers, and that was on The Hayride's bill for 14th February 1953. Their FLAIR recordings sound as though they could have been recorded in Shreveport with the Hayride's house band, that is especially evident on their cover of "Mexican Joe". 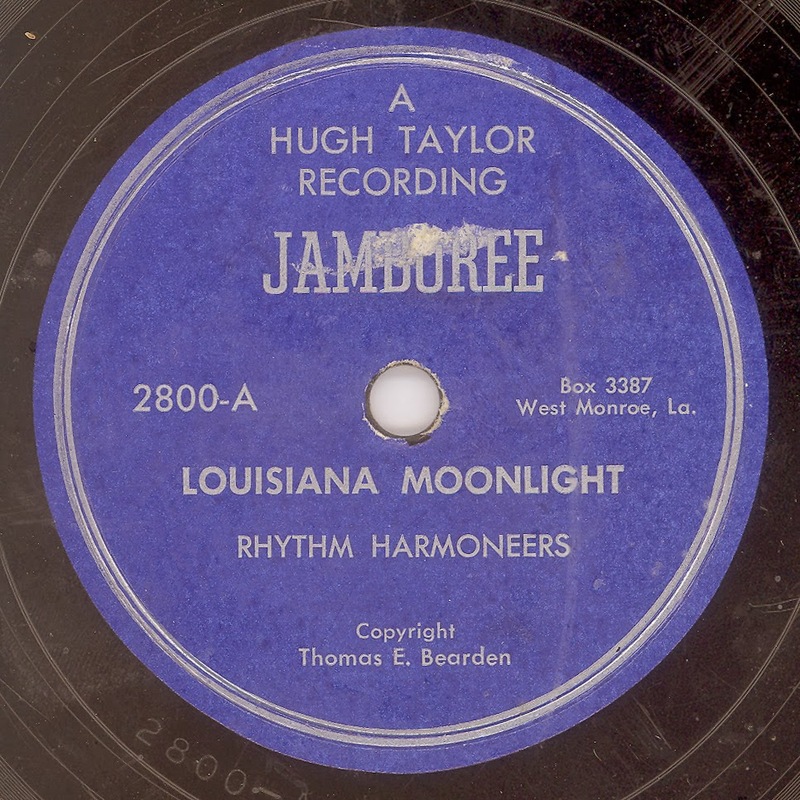 The Harmoneer's may have comprised of Thomas E. Bearden (who was perhaps the Tom Bearden who recorded for FABOR? ), Brian Douglas Ritter, and Messrs Tiner and McGee, I wonder if the latter was Billy McGee who recorded for IMPERIAL and RCA? 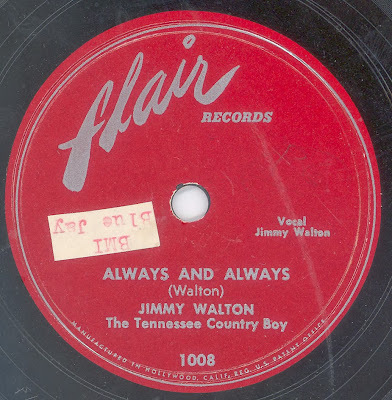 The members on Flair (1952-53) were Tom Bearden on acoustic guitar, Bryan Ritter on Fender double-neck 8 string lap steel, and Harry Liner on standup bass. 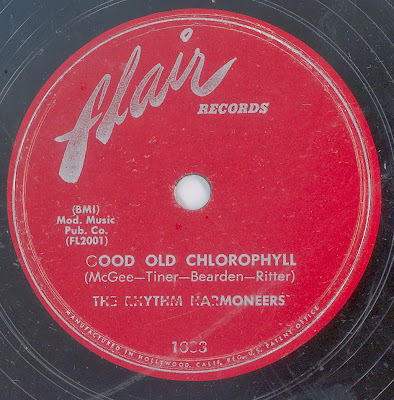 That's all 3 of them singing on "Good Old Chlorophyll". They joined the Hayride just after Hank left the Opry. Bryan is a retired mechanical engineer and still living in West Monroe. He still plays pedal steel. Thank you anonymous for that superb information, I wonder if the Tiner credited as co-writer of "Good Old Chlorophyll" is a misprint and that it is infact Harry Liner? 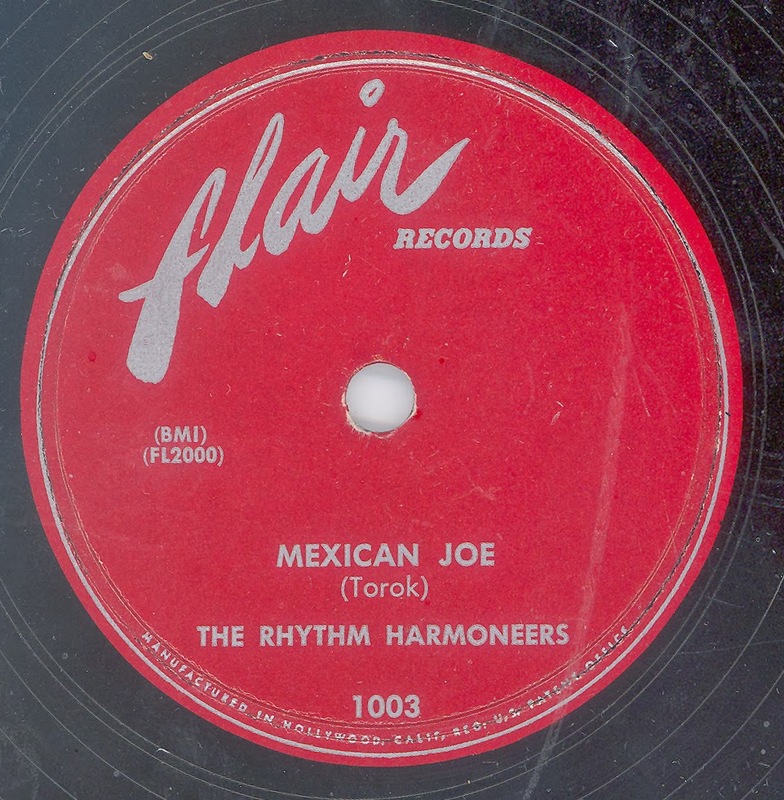 The Bihari Brothers FLAIR label, a subsidiary company of their much larger MODERN set up, is probably best known for its Rhythm & Blues recordings, many of which enjoyed chart success in the mid fifties. 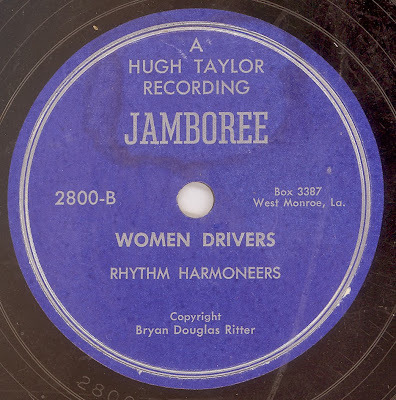 However, the label initially started out as a vehicle for Hillbilly material, representing a second stab at that market by the Bihari's, perhaps spurred on by growing popularity of the genre nationally. The first ten releases on FLAIR were all Hillbilly, featured here is Jimmy Walton's sole offering on the label. 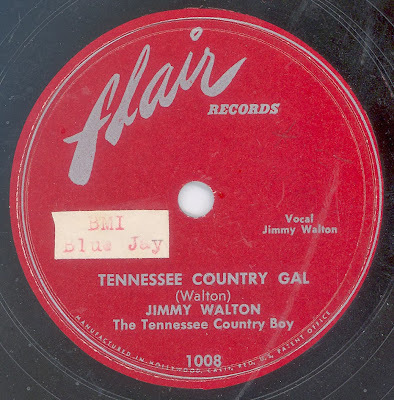 Walton, who appears to have been based on the West Coast, also had two releases on STARDAY.